Members of the Texas Parks and Wildlife Foundation represent a diverse cross section of the population that share a passion for the outdoors. Texas Parks and Wildlife Foundation is the nonprofit arm of Texas Parks and Wildlife department and helps to fund initiatives that conserve our wild places and wild things. Join TPWF by April the 12th to be entered into a chance to win a half day fly fishing trip with Texas fly-fishing guide Alvin Dedeaux. Jay Kleberg is Director of Conservation Initiatives at Texas Parks and Wildlife Foundation. The Colorado River is the staging area for this fly-fishing trip. There are very few people who know that the Colorado River that flows through the Hill Country and to the coast has some world-class fishing because it goes through some major urban areas. And Alvin’s one of the few people who really knows that water, and has focused not just on the Hill Country, but the coast and the Colorado River, itself. So, it’s a once-in-a-lifetime opportunity to go with a true expert. 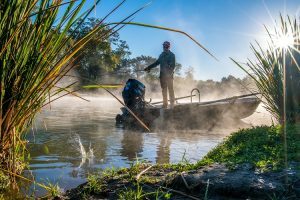 Become a member of the Texas Parks and Wildlife Foundation by April 12 to be entered in a drawing for a half day of fly-fishing with celebrated fishing guide, Alvin Dedeaux. We’ll speak with him about fly-fishing next time. People are drawn to it, and once they get into it—for most people—it becomes a lifelong passion. Learn more about the Texas Parks and Wildlife Foundation and how to become a member at wewillnotbetamed.org. This entry was posted on Wednesday, April 3rd, 2019 at 12:00 am	and is filed under Fishing, Freshwater, Freshwater Fish, Texas Parks and Wildlife Foundation. You can follow any responses to this entry through the RSS 2.0 feed. You can skip to the end and leave a response. Pinging is currently not allowed.